On the first day of each Making Memories session, Karley sits the kids down and has them decide what the week’s rules should be. She deserves credit for doing so; it’s hard to argue with the camp leader when one is bound by one’s own words. 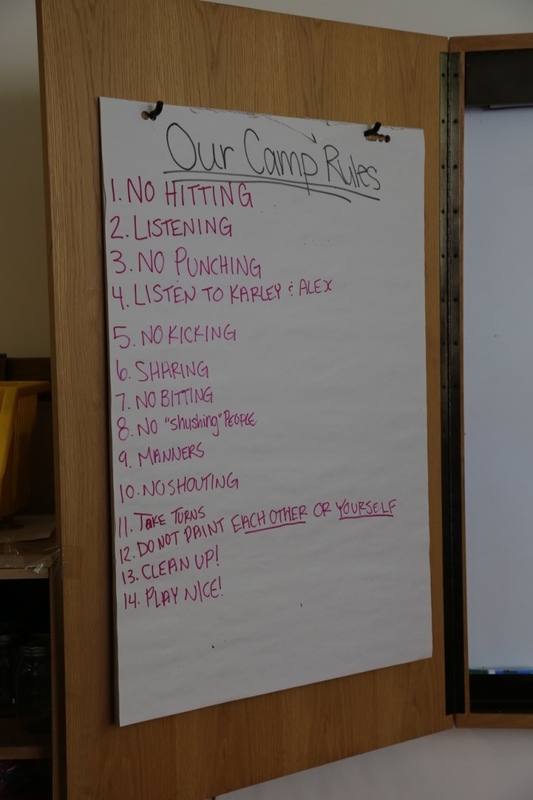 Not only have our kids set the standard, but contributing in such a way provides the motivation to follow camp rules. I’ve spent a lot of time laughing at the rule sheet, hanging at the front of the classroom in Saar School. From the looks of it, this group has seemingly violent tendencies. A definite 36% – and an arguable 57% – of their rules forbid not-nice interaction, but again, it’s probably better this way. If we had categorized hitting and punching and kicking and biting and shouting all under “Play nice”, that may have been giving the little tykes too much freedom of interpretation. All kidding aside (and I truly am kidding – these guys were awesome to have at the museum), it has been a fun and rewarding week. First of all, this group was larger than our July session, and while we welcomed back those participants, I think the kids themselves were happy for new faces. Apparently Karley and I aren’t as cool as we like to think we are. By the end of her time at the camp, I could get a “Hi” back from Natalie, who had remained more reserved than the other participants. I was so proud to see her speak freely – while perhaps more infrequently – with her peers. The twins, Ashton and Terrance, also grew more confident around us. In the July session, both boys were still hesitant to jump into crafts or voice their opinion, but August proved no such restriction. And their bond with Kelly is something else. The admiration they hold for Kelly was clear, and the patience and kindness with which the older boy responded to their attention made the mutuality obvious. My comedy act has never been better, thanks to Aubrey’s arsenal of knock-knock jokes. During Thursday’s lunch break, the kids had nearly finished in half the time we had scheduled and I was desperate to keep them at the table a little longer. Thankfully, Aubrey was well equipped. For the next three days, jokes became a regular part of our lunch routine. That girl, I learned, has an impressive knock-knock repertoire. The real success? At the end of the week, everyone knew that the lady with curly, red hair was Karley and that her blonde sidekick was Alex. I can’t say why our names were hard to learn, but they were. Our August session was inspired by the museum’s exhibits. We made stained glass to match the windows in the Bethlehem Lutheran Church. After looking at the old radio, we made our own records. Each camper went home with a lantern, similar to the railway one that we have on display. And between craft time and bathroom or lunch breaks, we went to the park or played outside. One surprising development was the popularity Pictionary earned among our group. Maybe it was due to the fact that they got to draw on the whiteboard with Ms. Karley’s markers; maybe it was the result of their freedom to draw whatever they dreamt up. Ashton, after drawing a dog on a road beside a police officer chasing another man under the sun, informed his defeated audience that no, he had not drawn just a dog, or just a police officer, or just a criminal, but all of the above and more. It’s a hard game of Pictionary when you’re playing with a da Vinci wanna-be. Now, the week is over and Karley and I are stuck prefixing the other’s names with “Ms”. When we begin to ask each other if it’s okay to use the bathroom, we’ll know the kids have greatly impacted our life. If there comes a time that we ask for help in the bathroom, then we’ll know their effect has not been entirely positive. Once again, it’s quiet at Kronau Museum and it seems to me that it’s never been so quiet; the silence is a harsh comparison to the giggling chaos we just hosted. We hope that each camper enjoys the rest of their summer and that they’ll grace us with a visit before school starts again. See you soon, friends!